Definition at line 300 of file llfloater.h. Definition at line 324 of file llfloater.h. Definition at line 1745 of file llfloater.cpp. References FALSE, resetStartingFloaterPosition(), and LLUICtrl::setTabStop(). Definition at line 2252 of file llfloater.cpp. References LLFloater::clearSnapTarget(), FALSE, LLRectBase< Type >::getHeight(), LLView::getLocalSnapRect(), LLView::getParent(), LLView::getRect(), LLFloater::getResizeLimits(), getSnapRect(), LLRectBase< Type >::getWidth(), LLFloater::isMinimized(), LLFloater::isResizable(), llmax(), llmin(), LLView::reshape(), S32, LLView::translateIntoRect(), and TRUE. Referenced by LLFloater::addDependentFloater(), LLTearOffMenu::create(), LLEmbeddedNotecardOpener::fire(), LLNewWindow::handleEvent(), LLViewerWindow::initWorldUI(), LLFloaterAudioVolume::LLFloaterAudioVolume(), LLPanelContents::onClickNewScript(), LLFloater::onClickTearOff(), open_landmark(), open_notecard(), open_texture(), LLTaskAnimationBridge::openItem(), LLTaskGestureBridge::openItem(), LLTaskNotecardBridge::openItem(), LLTaskLSLBridge::openItem(), LLLSLTextBridge::openItem(), LLAnimationBridge::openItem(), LLGestureBridge::openItem(), LLSoundBridge::openSoundPreview(), LLAnimationBridge::performAction(), refresh(), LLFloaterSnapshot::show(), LLFloaterPermissionsMgr::show(), LLFloaterAvatarTextures::show(), LLAlertDialog::show(), LLInventoryView::showAgentInventory(), LLShowProps::showProperties(), LLPreviewTexture::updateAspectRatio(), and LLMultiFloater::updateResizeLimits(). Definition at line 2219 of file llfloater.cpp. References LLFloater::canClose(), LLView::getChildList(), LLView::getVisible(), and S32. Definition at line 1992 of file llfloater.cpp. References LLFocusMgr::childHasKeyboardFocus(), FALSE, LLView::getChildList(), getFloaterByHandle(), LLFloater::getFloaterByHandle(), LLPanel::getHandle(), LLFloater::getHost(), gFocusMgr, LLFloater::isDependent(), LLFloater::mDependents, LLView::sendChildToFront(), LLFloater::setFocus(), LLFloater::setMinimized(), and TRUE. Referenced by LLFloater::addDependentFloater(), LLFloater::bringToFront(), LLLandEdit::handleEvent(), LLFloaterColorPicker::handleMouseDown(), LLMenuItemBranchDownGL::openMenu(), LLMenuItemBranchGL::openMenu(), LLAlertDialog::show(), and syncFloaterTabOrder(). Definition at line 2191 of file llfloater.cpp. References LLFloater::canClose(), LLFloater::close(), end, and LLView::getChildList(). Referenced by app_request_quit(), and LLFileCloseAllWindows::handleEvent(). Definition at line 2186 of file llfloater.cpp. Definition at line 2301 of file llfloater.cpp. References LLView::draw(), LLView::drawChild(), LLView::getChildList(), getFocusedFloater(), mFocusCycleMode, refresh(), and TABBED_FLOATER_OFFSET. Definition at line 1918 of file llfloater.cpp. References LLFloater::getFloaterByHandle(), LLRectBase< Type >::getHeight(), LLView::getRect(), LLView::getVisible(), LLRectBase< Type >::getWidth(), height, i, llmax(), LLRectBase< Type >::mBottom, LLFloater::mDependents, LLRectBase< Type >::mLeft, LLView::mRect, LLRectBase< Type >::mRight, LLRectBase< Type >::mTop, LLRectBase< Type >::rectInRect(), S32, LLRectBase< Type >::stretch(), LLRectBase< Type >::translate(), LLRectBase< Type >::unionWith(), and width. Referenced by LLPanelEstateInfo::addAllowedGroup(), LLFloater::addDependentFloater(), LLFloaterGesture::onClickEdit(), LLPanelPermissions::onClickGroup(), and LLPanelLandGeneral::onClickSetGroup(). Definition at line 2127 of file llfloater.cpp. References getFrontmost(), LLFloater::setFocus(), and TRUE. Definition at line 2361 of file llfloater.cpp. Definition at line 1987 of file llfloater.cpp. Definition at line 2396 of file llfloater.cpp. References LLView::getChildList(), NULL, and LLViewHandle::sDeadHandle. Referenced by bringToFront(), LLFloater::draw(), LLMultiPreview::getAutoOpenInstance(), highlightFocusedFloater(), and reshape(). Definition at line 2335 of file llfloater.cpp. References LLView::getChildList(), LLUICtrl::isCtrl(), and NULL. 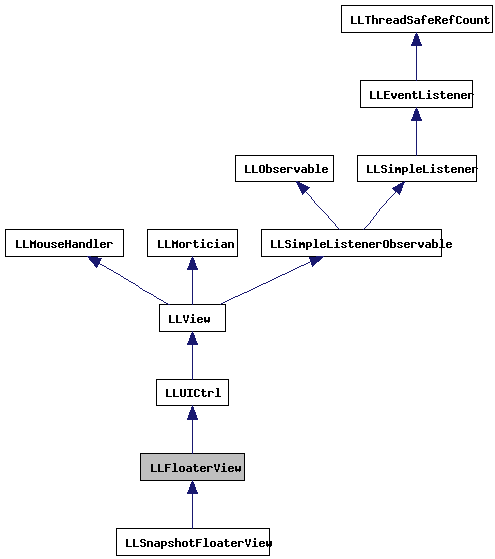 Referenced by draw(), and LLFileEnableCloseWindow::handleEvent(). Definition at line 2348 of file llfloater.cpp. Referenced by focusFrontFloater(), handle_save_to_xml(), LLFileSaveTexture::handleEvent(), LLFileEnableSaveAs::handleEvent(), LLFloater::isFrontmost(), and LLVoiceHotkeySelectDialog::LLVoiceHotkeySelectDialog(). Definition at line 2136 of file llfloater.cpp. References FALSE, LLView::getChildList(), LLRectBase< Type >::getHeight(), LLView::getLocalSnapRect(), LLRectBase< Type >::getWidth(), LLFLOATER_HEADER_SIZE, LLRectBase< Type >::mBottom, MINIMIZED_WIDTH, LLRectBase< Type >::mLeft, r, S32, and TRUE. Definition at line 1855 of file llfloater.cpp. References bottom, FALSE, first, LLRectBase< Type >::getHeight(), LLWindow::getSize(), LLRectBase< Type >::getWidth(), LLView::getWindow(), mColumn, MENU_BAR_HEIGHT, mNextLeft, mNextTop, LLCoord::mX, LLCoord::mY, resetStartingFloaterPosition(), right, S32, and TRUE. Referenced by LLFloaterNotRunQueue::create(), LLFloaterRunQueue::create(), LLFloaterResetQueue::create(), LLFloaterCompileQueue::create(), doToSelected(), LLEmbeddedNotecardOpener::fire(), LLNewWindow::handleEvent(), LLPanelAvatar::onClickKick(), LLPanelGridTools::onClickKickAll(), LLPanelContents::onClickNewScript(), open_landmark(), open_notecard(), open_texture(), LLViewerTextEditor::openEmbeddedTexture(), LLTaskAnimationBridge::openItem(), LLTaskNotecardBridge::openItem(), LLTaskLSLBridge::openItem(), LLTaskTextureBridge::openItem(), LLLSLTextBridge::openItem(), LLAnimationBridge::openItem(), LLFolderView::openSelectedItems(), LLTaskSoundBridge::openSoundPreview(), LLSoundBridge::openSoundPreview(), LLAnimationBridge::performAction(), LLFolderView::propertiesSelectedItems(), LLFloaterScriptSearch::show(), LLFloaterSaveAvatar::show(), LLFloaterRegionInfo::show(), LLFloaterPostcard::showFromSnapshot(), LLTextureCtrl::showPicker(), LLTaskInvFVBridge::showProperties(), and LLShowProps::showProperties(). Definition at line 2413 of file llfloater.cpp. Referenced by LLPanelEstateInfo::addAllowedGroup(), LLPanelGroupInvite::impl::callbackClickAdd(), LLPanelGroupTab::handleClickHelp(), LLPanelLandBan::onClickAdd(), LLPanelLandAccess::onClickAdd(), LLPanelFriends::onClickAddFriend(), LLPrefsVoice::onClickDeviceSettingsBtn(), LLPanelPermissions::onClickGroup(), LLPanelRegionGeneralInfo::onClickKick(), LLPanelEstateInfo::onClickKickUser(), LLFloaterReporter::onClickSelectAbuser(), LLPanelObjectTools::onClickSet(), LLPanelLandGeneral::onClickSetGroup(), LLTextureCtrl::showPicker(), and LLColorSwatchCtrl::showPicker(). Definition at line 2327 of file llfloater.cpp. References LLRectBase< Type >::mBottom, LLView::mRect, and mSnapOffsetBottom. Definition at line 1759 of file llfloater.cpp. Definition at line 1754 of file llfloater.cpp. Definition at line 2431 of file llfloater.cpp. Definition at line 2075 of file llfloater.cpp. References LLFocusMgr::childHasKeyboardFocus(), LLView::getChildList(), getFloaterByHandle(), gFocusMgr, LLFloater::setForeground(), and TRUE. Definition at line 2459 of file llfloater.cpp. Definition at line 2446 of file llfloater.cpp. Definition at line 2239 of file llfloater.cpp. References adjustToFitScreen(), LLView::getChildList(), and TRUE. Definition at line 1900 of file llfloater.cpp. References LLRectBase< Type >::getHeight(), LLWindow::getSize(), LLRectBase< Type >::getWidth(), LLView::getWindow(), mColumn, MENU_BAR_HEIGHT, mNextLeft, mNextTop, LLCoord::mX, LLCoord::mY, and S32. Referenced by getNewFloaterPosition(), inventory_offer_callback(), and LLFloaterView(). Definition at line 1771 of file llfloater.cpp. References FOLLOWS_BOTTOM, FOLLOWS_LEFT, FOLLOWS_RIGHT, FOLLOWS_TOP, LLView::getChildList(), getFloaterByHandle(), LLRectBase< Type >::getHeight(), LLView::getRect(), LLRectBase< Type >::getWidth(), LLFloater::isDependent(), llabs(), LLFloater::mDependents, LLView::mRect, r, LLView::reshape(), S32, and LLView::setFollows(). Definition at line 1765 of file llfloater.cpp. Definition at line 1840 of file llfloater.cpp. Definition at line 1982 of file llfloater.cpp. 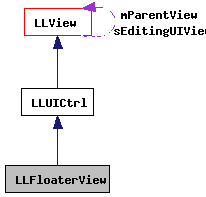 Referenced by LLViewerWindow::handleKey(), and LLViewerWindow::handlePerFrameHover(). Definition at line 354 of file llfloater.h. Definition at line 2375 of file llfloater.cpp. References bringToFront(), LLFocusMgr::childHasKeyboardFocus(), FALSE, LLView::getChildList(), gFocusMgr, and LLView::moveChildToFrontOfTabGroup(). Definition at line 2117 of file llfloater.cpp. Definition at line 357 of file llfloater.h. Referenced by getNewFloaterPosition(), and resetStartingFloaterPosition(). Definition at line 360 of file llfloater.h. Referenced by draw(), getCycleMode(), and setCycleMode(). Definition at line 358 of file llfloater.h. Definition at line 359 of file llfloater.h. Definition at line 361 of file llfloater.h. Referenced by getSnapRect(), and setSnapOffsetBottom().